Obi Okonkwo is an idealistic young man who, thanks to the privileges of an education in Britain, has now returned to Nigeria for a job in the civil service. However in his new role he finds that the way of government seems to be backhanders and corruption. Obi manages to resist the bribes that are offered to him, but when he falls in love with an unsuitable girl - to the disapproval of his parents - he sinks further into emotional and financial turmoil. The lure of easy money becomes harder to refuse, and Obi becomes caught in a trap he cannot escape. Showing a man lost in cultural limbo, and a Nigeria entering a new age of disillusionment, No Longer at Ease concludes Achebe's remarkable trilogy charting three generations of an African community under the impact of colonialism, the first two volumes of which are Things Fall Apart and Arrow of God. The novel opens with the trial of Obi Okonkwo on a charge of accepting a bride. It then jumps back in time to a point before his departure for England and works its way forward to describe how Obi ended up on trial. The members of the Umuofia Progressive Union (UPU), a group of Igbo men who have left their villages to live in major Nigerian cities, have taken up a collection to send Obi to England to study law, in the hope that he will return to help his people navigate English colonial society. But once there, Obi switches his major to English and meets Clara Okeke for the first time during a dance. Obi returns to Nigeria after four years of studies and lives in Lagos with his friend Joseph. He takes a job with the Scholarship Board and is almost immediately offered a bribe by a man who is trying to obtain a scholarship for his little sister. When Obi indignantly rejects the offer, he is visited by the girl herself who implies that she will bribe him with sexual favors for the scholarship, another offer Obi rejects. At the same time, Obi is developing a romantic relationship with Clara Okeke, a Nigerian girl who eventually reveals that she is an osu, an outcast by her descendants, meaning that Obi can not marry her under the traditional ways of the Igbo people of Nigeria. While he remains intent on marrying Clara, even his Christian father opposes it, although reluctantly due to his desire to progress and eschew the "heathen" customs of pre-colonial Nigeria. His mother begs him on her deathbed not to marry Clara until after her death, threatening to kill herself if Obi disobeys. When Obi informs Clara of these events, Clara breaks the engagement and intimates that she is pregnant. Obi arranges an abortion, which Clara reluctantly undergoes, but she suffers complications and refuses to see Obi afterwards. Chinua Achebe was born in Nigeria in 1930. He was raised in the large village of Ogidi, one of the first centers of Anglican missionary work in Eastern Nigeria, and is a graduate of University College, Ibadan. His early career in radio ended abruptly in 1966, when he left his post as Director of External Broadcasting in Nigeria during the national upheaval that led to the Biafran War. 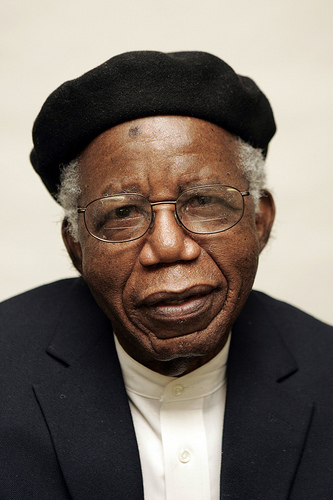 Achebe joined the Biafran Ministry of Information and represented Biafra on various diplomatic and fund-raising missions. He was appointed Senior Research Fellow at the University of Nigeria, Nsukka, and began lecturing widely abroad. For over fifteen years, he was the Charles P. Stevenson Professor of Languages and Literature at Bard College. He is now the David and Marianna Fisher University Professor and professor of Africana studies at Brown University. Chinua Achebe has written over twenty books - novels, short stories, essays and collections of poetry - and has received numerous honours from around the world, including the Honourary Fellowship of the American Academy of Arts and Letters, as well as honourary doctorates from more than thirty colleges and universities. He is also the recipient of Nigeria's highest award for intellectual achievement, the Nigerian National Merit Award. In 2007, he won the Man Booker International Prize for Fiction.